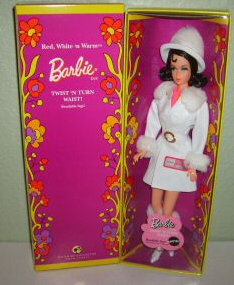 2007 Red White 'n Warm Vintage Barbie Reproduction features a reproduction TNT Barbie doll with a flip (or Marlo Thomas) hairstyle. It is a Gold Label Collectible Barbie Doll - limited to no more than 5900 dolls worldwide - from the Vintage Barbie Reproduction Collection. 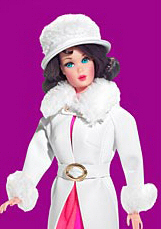 Like the ultra-rare Red White 'n Warm Vintage Christie Reproduction, Barbie is wearing a reproduction of the Mod ensemble - Red White 'n Warm #1491 (1969 - 1970). It includes a white vinyl coat with faux white fur, a matching fur trimmed hat and white vinyl boots with gold ankle chains and faux fur trim. Underneath it is a sleeveless color block dress in orange and hot pink. Like the original, Barbie has a TNT waist, bendable legs and long rooted eyelashes.